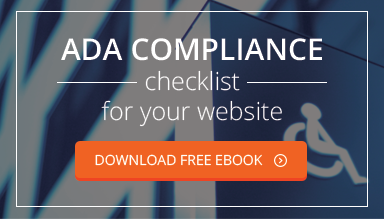 ADA Compliance Checklist: Is Your Website Accessible? NP GroupBlogIndustry NewsADA Compliance Checklist: Is Your Website Accessible? The Americans with Disabilities Act was passed in 1990, long before e-commerce became a part of everyday life. Most people think of the ADA as applying to brick and mortar stores. However, now that consumers have moved online, the Department of Justice (DOJ) is redefining how the ADA applies to e-commerce business. The DOJ announced just last week it will postpone releasing web accessibility regulations until at least 2018, even though it has been discussing those regulations since 2010. But that doesn’t mean e-commerce businesses can sit back and relax for the next two years. Despite not having clear regulations, plaintiffs are winning lawsuits and collecting settlements for websites that courts decide are not in compliance. In fact, lifezette.com recently said these legal actions are "exploding as the Internet becomes more embedded in daily life." Is your business subject to the ADA’s requirements? If so, what can you do to ensure compliance and protect yourself from legal action? Title III of the ADA requires that businesses considered "public accommodations" must comply. Basically, businesses that serve the public are subject to ADA requirements. That's a pretty broad list that includes retail stores, banks, accountants, recreation venues, health care providers, and any other entity that's not a private club. Just as physical buildings can be difficult to navigate for a disabled person, a website can have barriers too. Web designers often fail to consider the blind and deaf, or simply those that cannot use a mouse to navigate their websites. Disabled persons often use "assistive technology," such as screen readers or voice recognition software. Often times, very simple adjustments to your website can make them more accessible for the disabled. Add text to your images. Many websites include images. However, if there is no text to identify the image, a blind person's screen reader could not identify the image. The user would not have any way of knowing if the image is a logo, link to another page or simply a stock photo. For example, a state website may have a picture of the governor. The blind person should be able to use their screen reader to go over the image and hear, "photo of the Governor [name]." Another simple adjustment you could make is to not post documents in PDF format. Image based formats are challenging to the visually impaired because they cannot be read by screen readers or text enlargement programs. Allow for adjustments in color and font size. Web designers often design in such a way that does not allow the user to adjust font size or color. While they may be protecting their brand, they are also inhibiting some users. Many visually impaired need to use high contrast color settings or very large fonts to read a website. Don't design your website in a way that makes it impossible for them to do this. Make images and video more accessible by adding audio descriptions to images, including narration of changes in setting, gesturing and other details. In addition, add text captions for the deaf. The launching pad for much of the recent litigation was in 2008, with a lawsuit against Target for not making its website accessible to the blind. The retail giant settled, agreeing to pay $6 million to members of the class-action suit plus another $3.7 million in court fees. With a lack of clear regulations from the DOJ, our best source of guidance is to look at rulings handed down by courts already. Here are a few lessons learned. It doesn't matter if you do not have a brick and mortar equivalent. This past September marked the first time a judge ruled that the ADA applies even to businesses without a physical location. Scribd, an e-book subscription service is considered to provide "a place of public accommodation." Their services are not accessible to blind persons because they cannot be read with a screen reader. The judge reasoned, "Now that the Internet plays such a critical role in the personal and professional lives of Americans, excluding disabled persons from access to covered entities that use it as their principal means of reaching the public would defeat the purpose of this important civil rights legislation." State regulations must be considered as well. Federal law isn't the only consideration for businesses. Additionally, each state interprets the law differently. Consider the case against Netflix in 2012. Lawsuits were brought in federal court in Massachusetts and California. Netflix was accused of violating the ADA by not offering "closed captioning" options for its Internet streamed movies. Illustrating the complexity of this issue, the courts reached completely opposite decisions. Massachusetts held that Netflix must comply with the ADA, while the California court found that Netflix did not fall under the ADA's definition of "public accommodation." Your apps need to be compliant too. The 2014 case involving Peapod, an online grocery retailer emphasizes that being ADA compliant goes beyond your website. The settlement required Peapod to make its mobile applications accessible by March 2015 and its website accessible by September 2015. Since mobile apps are fast becoming the preferred method of online shopping, e-commerce sites must focus on app accessibility too. Talk to your web designer about other techniques that will make your site more user-friendly for people with disabilities. Worried that’s not in your budget? Consider the fact that DOJ fines start at $75,000. And it's still yet to be determined if a non-compliant website is liable for one fine or will be charge per page for each violation. As the recent lawsuits illustrate, though, settlements quickly add up into the millions. While legal considerations might be your biggest worry, making your site more accessible is simply good customer service. More than 39 million Americans are blind and another 246 million have "low vision," Another one million are deaf in the U.S. Add to that people with mobility issues that prevent them from using their hands and that's a huge portion of the country's buying power. Include "skip navigation" at the top of your pages so people using screen readers can get directly to the content. Make sure blinking and flashing features can be paused and include visual and audible notifications if sounds automatically play. Use descriptive HTML tags on any online forms. Be sure your website is not only navigable with a mouse, but other means as well (such as a keyboard). Another important consideration is that the ADA does not allow businesses to simply provide an alternative such as a phone number. Lastly, include accessibility issues as part of your website and mobile strategy. When new technologies are implemented or pages added, part of the process should include the implications for persons with disabilities. From large corporations to small businesses, owners should anticipate more ADA scrutiny in the coming years. It's best to be proactive, not waiting for DOJ guidelines that may or may not come within the next three years. Avoid litigation by getting ahead of the curve, and improve your customer service along the way—it’s a no-brainer.